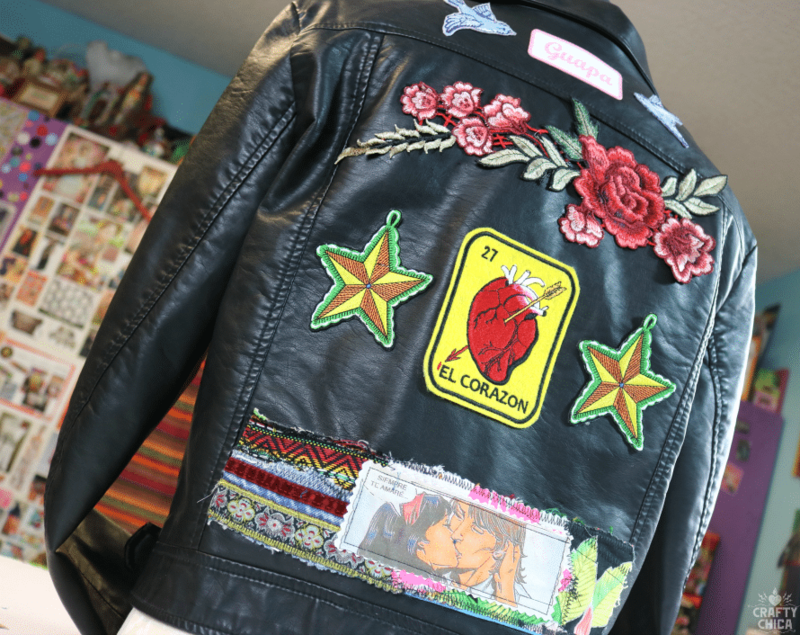 “Kathy, do you have a tutorial for a DIY patch jacket for an article I’m writing?” asked my friend Monique from CurvesAndChaos. “YES,” I quickly replied, knowing I’d be whipping up this project ASAP. I love her site, she is the goddess of all things fashionable, so when she tosses out a gem like this, I know to hop on it. 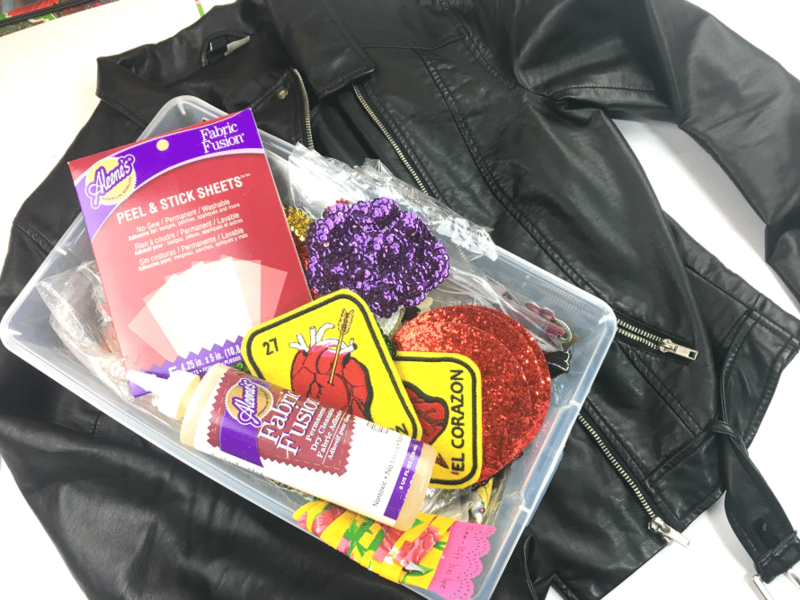 The best part is that I happened to have a lonely cast-off faux-leather jacket (actually, it was Maya’s), and a box FULL of patches! And lots o’ fabric glue. Seriously, Maya bought this jacket at H&M and for whatever reason abandoned it in my closet. So. FAIR GAME I say. This project is a winner. 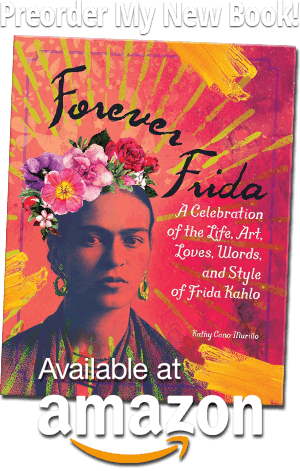 It allows you to mix and match a variety of designs to create a gasp-worthy coat, jacket, or even a hoodie. 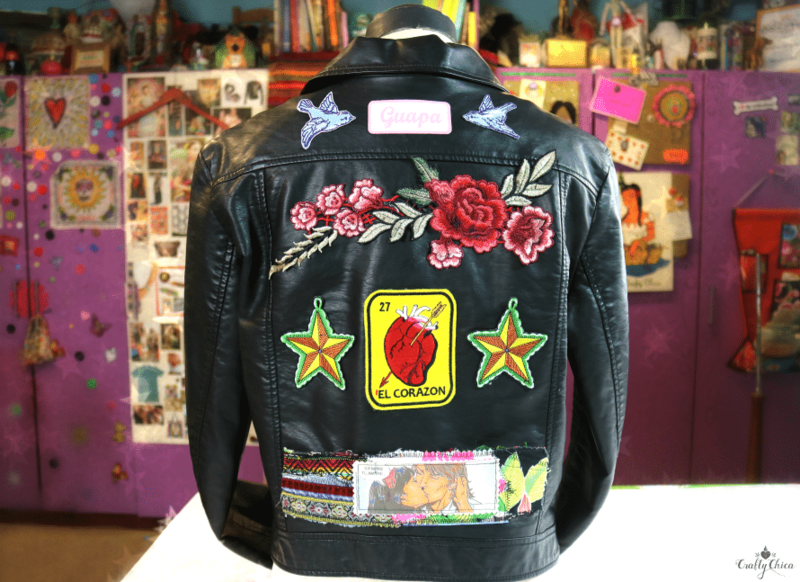 Just make sure you know that once to put on all these patches, your jacket can never go back to how it looked before. We good? Okay, let’s make it. 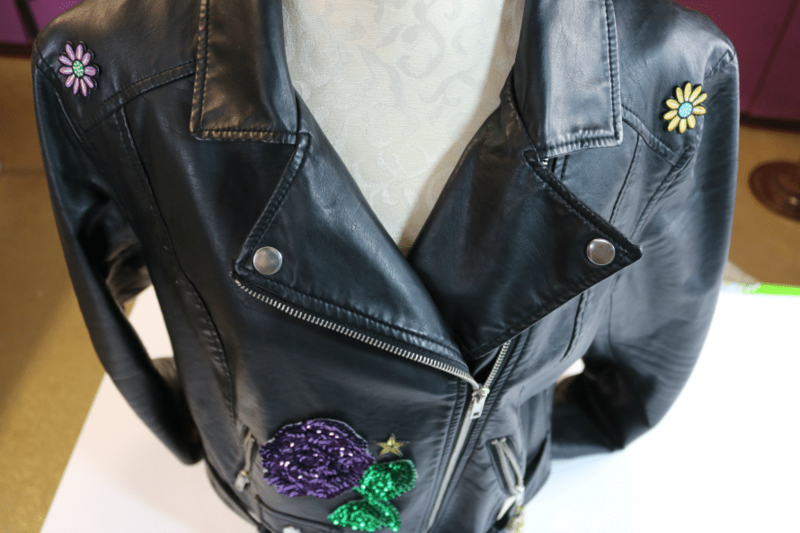 Jacket of your choice – check a local thrift store! 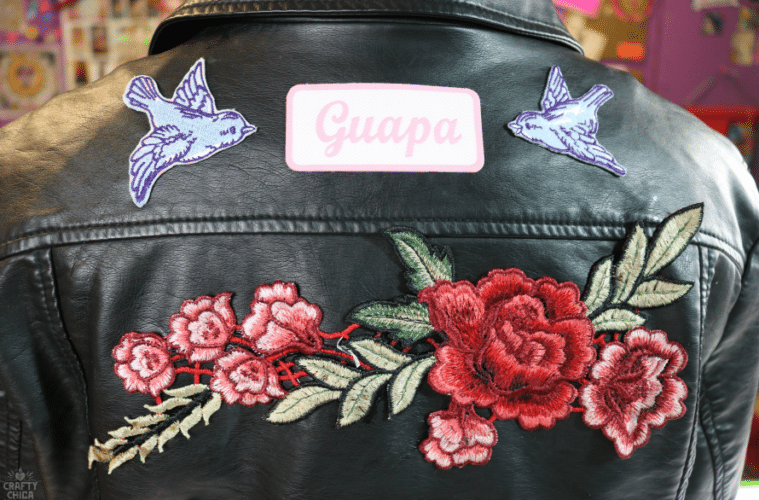 Assorted patches and appliques. 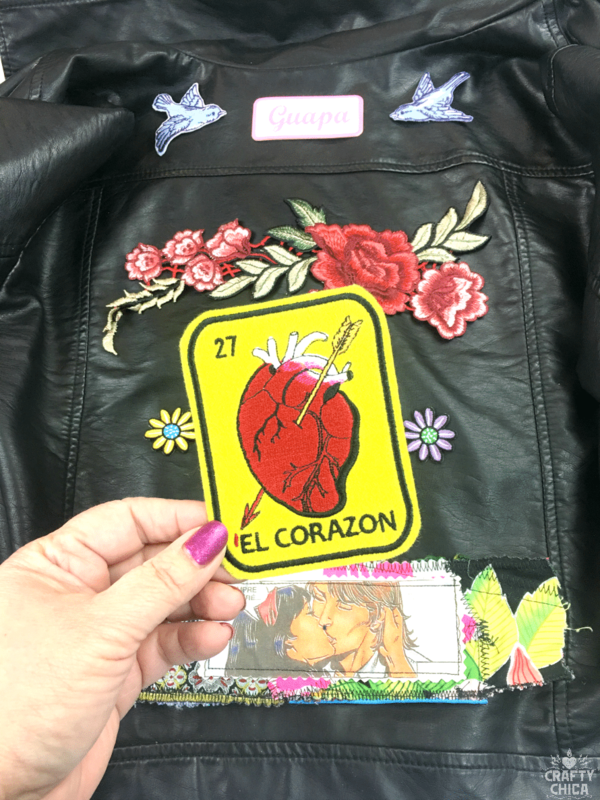 I bought the Corazon one on Etsy from seller LizMiera. 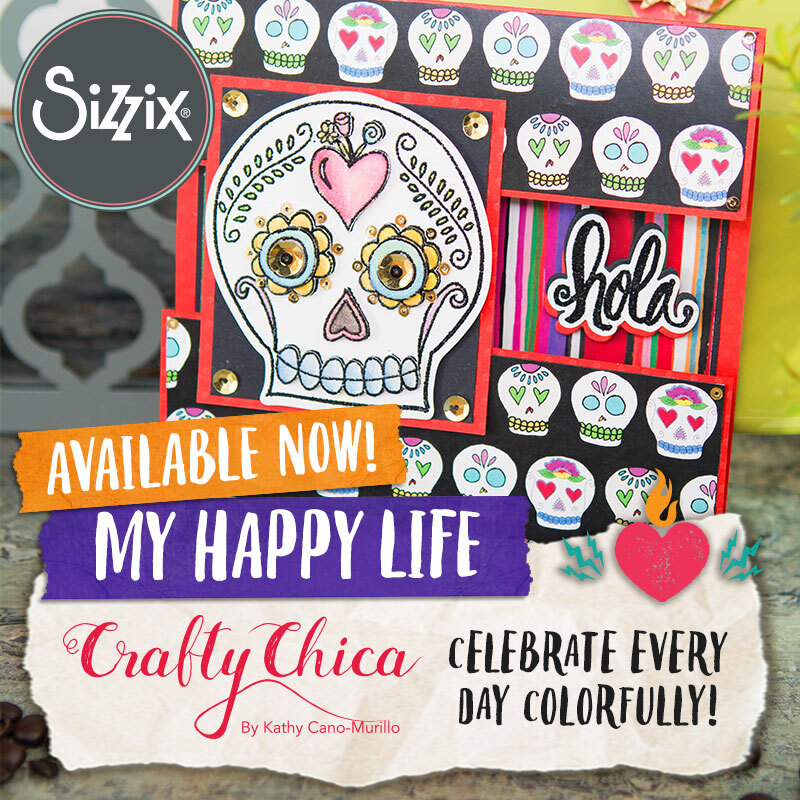 I also used some Crafty Chica patches, and the rest I bought in Mexico, on clearance or at fabric shops and shows. NOTE: You can use ‘iron-on’ patches, but sometimes the adhesive backing won’t affix well. And if you are applying them to a synthetic surface, you might scorch the jacket. 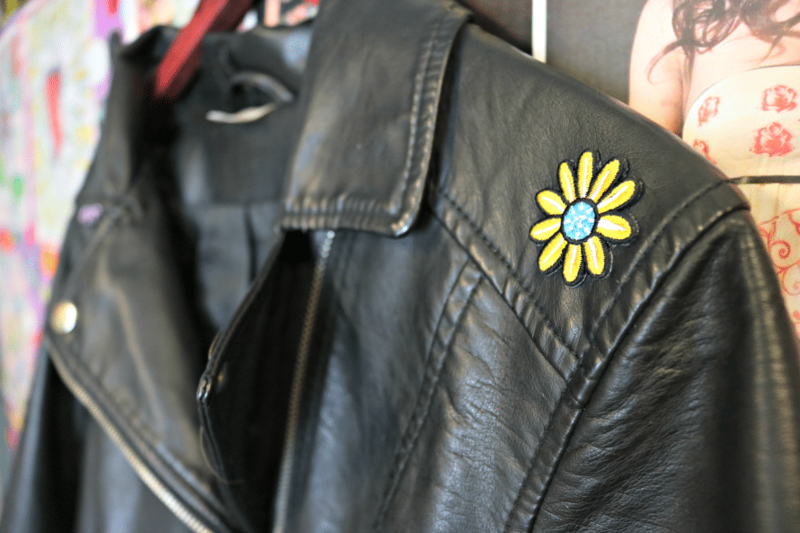 So I like to use fabric glue, or even hand stitch the patches. I like the adhesive sheets because they hold pretty tight. But if you are using them on a jacket that you’ll wash in the machine, I would outline the edges with puffy paint so they won’t curl through the process. First thing, decide if you want to trick out the front or the back of the jacket. I liked the back on this one, so I opened it up to be flat on the table and rearranged my patches until I found a design I liked. Don’t be afraid to play with different layouts! 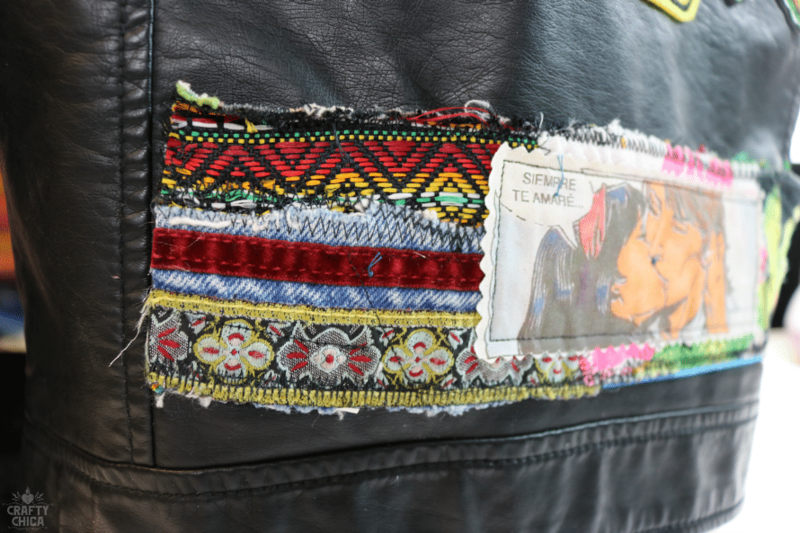 Choose one patch to be your focal point, then build out from there. 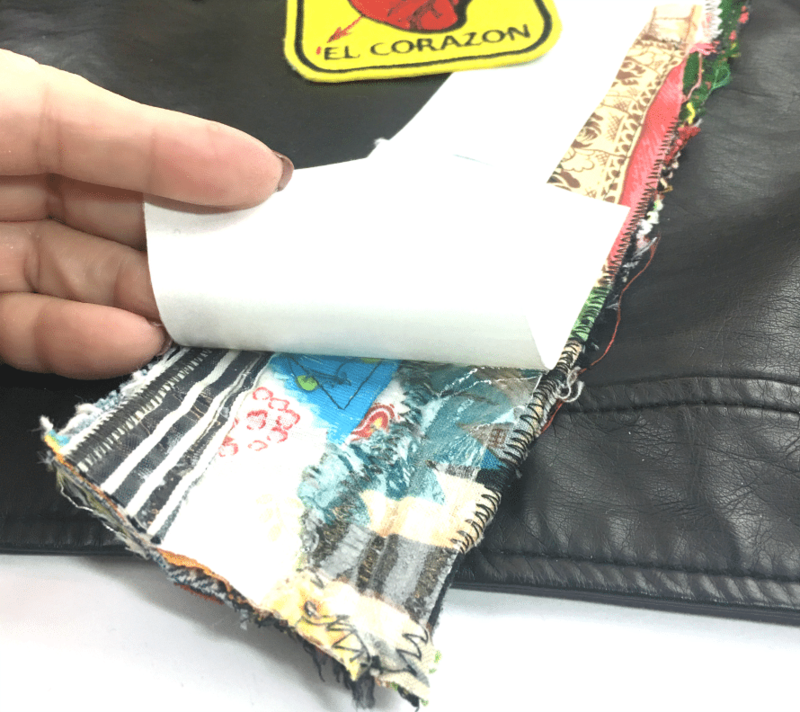 Cut the adhesive sheets to fit the size of the patches, and then peel off one side of the backing and apply to the back of the patch. Press the patch in place. 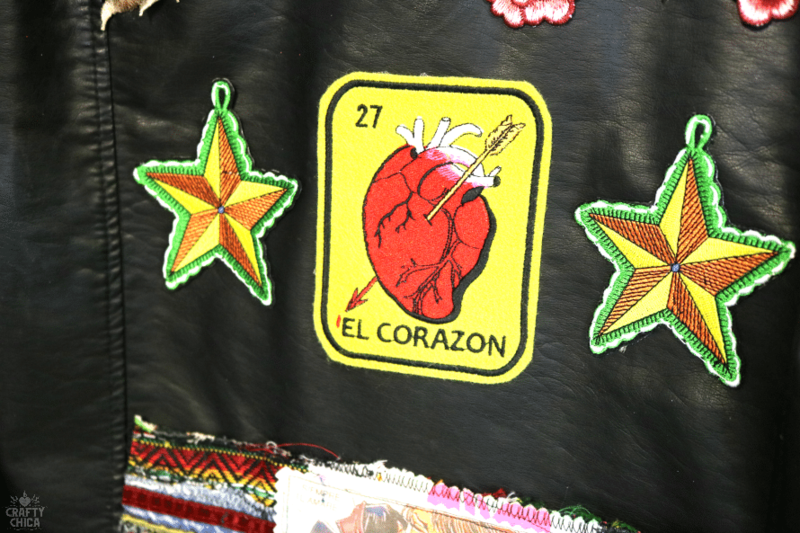 RELATED: Make a Mexi-Boho Jacket! This piece is a fabric collage belt I made for one of my books. I cut it up and gave it new life! The picture of the couple kissing is from a Mexican comic that I printed onto fabric. Once you have everything in place, hang it up and stand back and look to see if you missed anything. If you notice, you can see I have a row of three, then one, then three, then one. Not that you have to do that, but just to show balance. 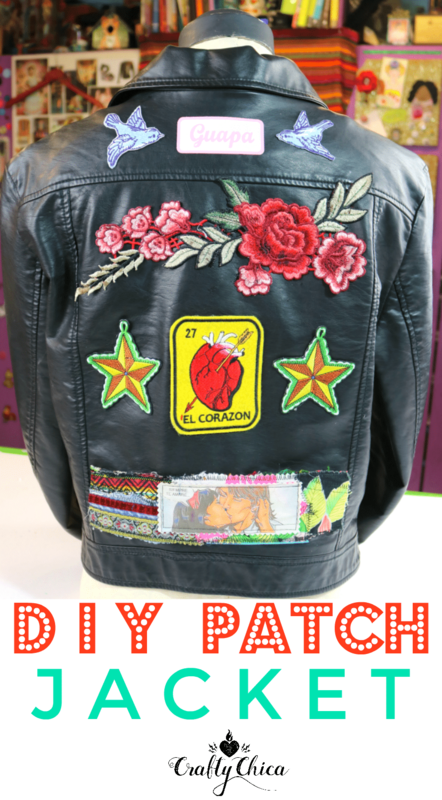 TIP: If you have patches that already have a heavy layer of adhesive, simply use a heat gun. Wave it over the adhesive until it softens and then carefully press in place. Watch your fingers, it will be hot! I wouldn’t use an iron because you can scorch your jacket! 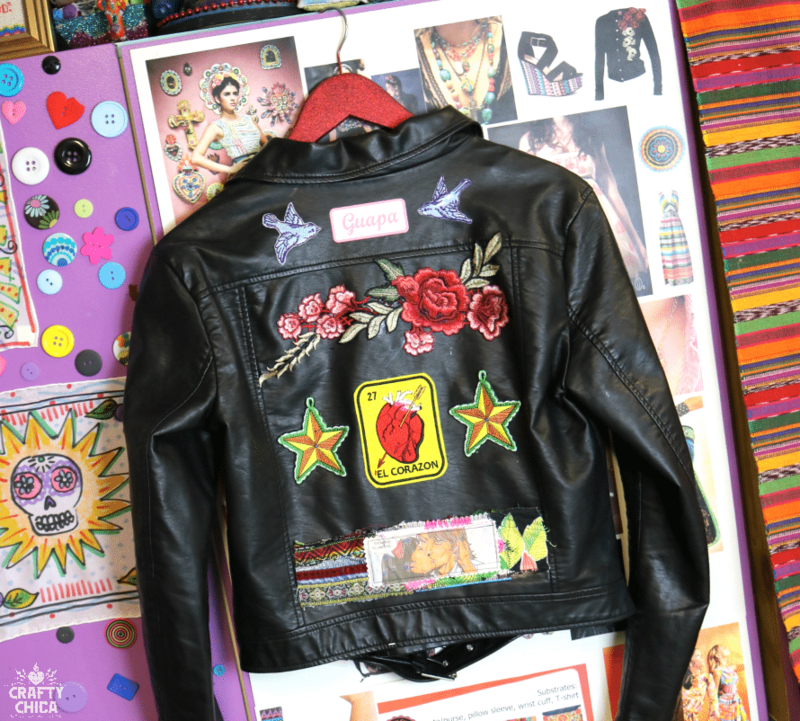 OMG, I wish this patch jacket was in my size! I love it! Once you are done, go ahead and dive into the front! I kept it pretty simple up front. I just added small patches on each shoulder. And a sequin flower and star at the bottom. 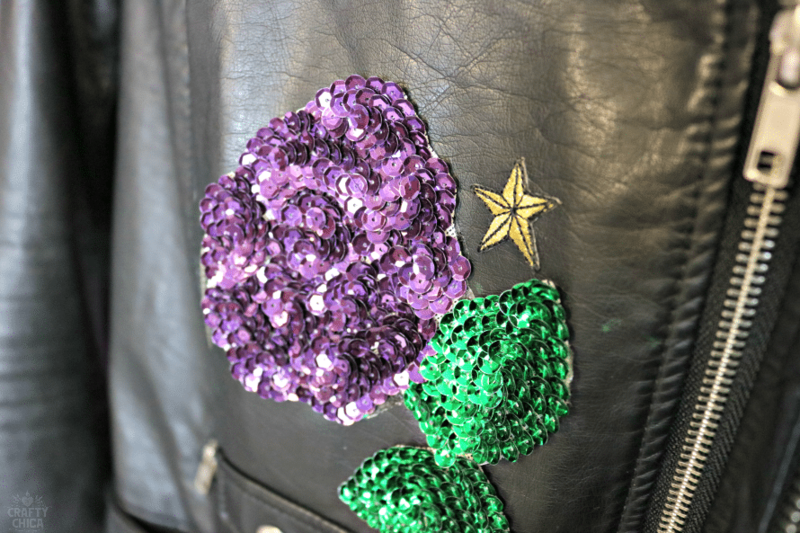 RELATED: How to Glitter a Jacket without a mess! These stars are from my applique collection I had in Michaels stores a few years back. I still have a whole bag of them. Wow, once it’s all together, it really pops! So much personality! Guapa is a word in Spanish that means a beautiful girl. 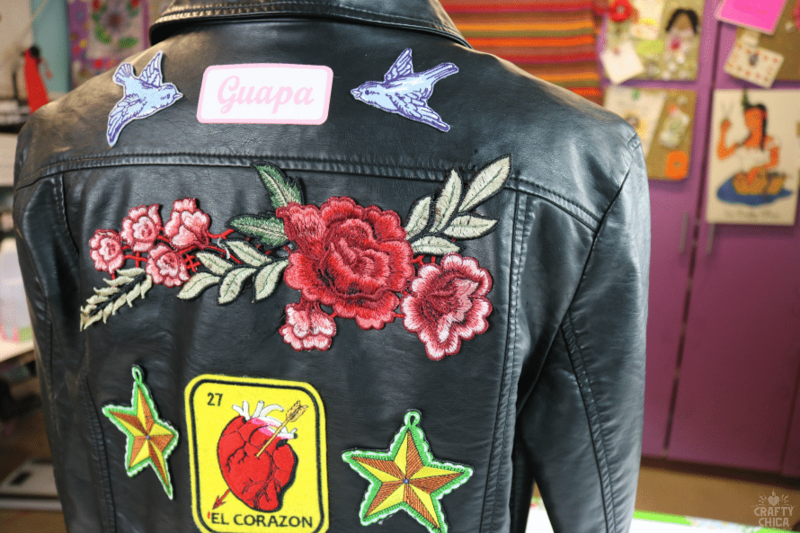 Are you ready to make a DIY patch jacket? What would you put on it, what are your dream patches? Now that I made this one, I definitely want to make one for me! The only bummer is now I don’t know what to do with this jacket. I’m going to see if maybe Maya wants it after all! 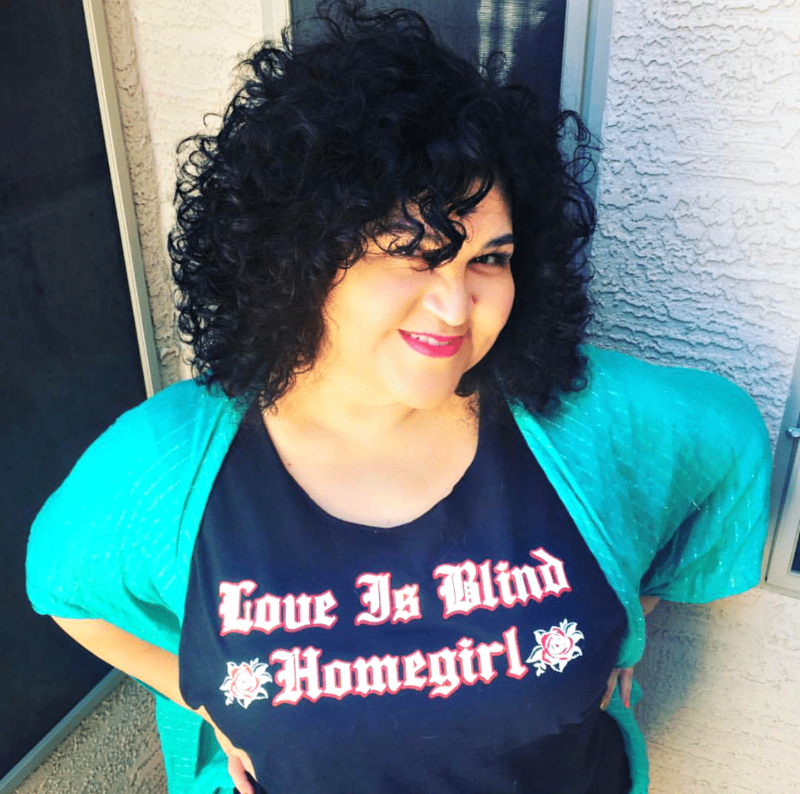 Speaking of fashion…I have a NEW podcast episode up, featuring designer, Angela Johnson! I’ll have a blog post on her coming up soon. Previous ArticleDIY Prosperity Plaques – Let’s Manifest Money!